I think I’m finally on the other side of this funk that I’ve had all week. Still chugging Nyquil before bed like nobody’s business, but hopefully tonight will be the last time. Well, our home décor has officially had its first casualty since having kids. We made it four years, two months, three weeks, and one day with no stained couches, no broken knick-knacks, no crayon-marked walls… nothing. Olivia decided, however, that this week it was time to break the streak. I was picking up the living room the other evening while the kids were playing happily, when I heard it. I immediately ran over to assess the damage and Olivia was staring up at me with a mischievous grin on her face and holding a chunk of the dust jacket of my beloved “Humans of New York” book. And I haven’t even read the whole book yet!! Y’all, my baby boy is reading!!!! He has loved books since he was itty bitty, he started talking at a very early age, and he started sounding out some simple three letter words about a year ago. The last time we practiced, it took him some time to read each one as he had to slowly sound each letter out before putting them together. Well, earlier this week he asked if we could practice reading some words on his chalkboard, and y’all, he blew me away. We went through at least 30-40 three and four letter words, and he was reading each one as quickly as I could write them on the board. I couldn’t believe it. His teacher actually just informed us yesterday that she’s placing him in an accelerated program since he already knows everything that they’re currently covering. He will stay in his same class, but he and a few other kids who are also on the same track will start learning sight words to pave the road to reading. We are having family pictures taken sometime in the next couple of weeks because I would like an updated picture to put on Christmas cards. 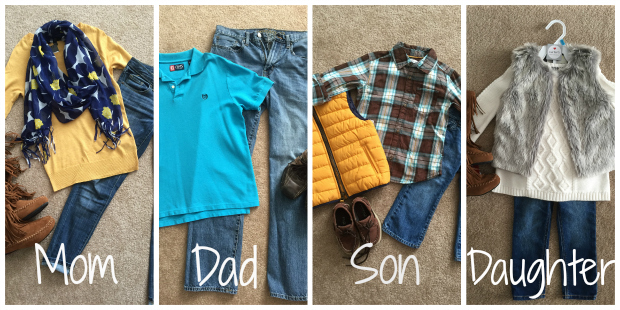 Yesterday I posted a few tips about how to coordinate outfits for the whole family to ensure that everything looks picture perfect. You can check that out here. I’ve been contacted several times regarding the ballet flats that I wear pretty frequently, so I thought I’d share them with everyone. Now I don’t usually splurge on shoes… the majority of mine are typically $30 or less because I adore fashion and the trends change so quickly that I can’t bring myself to spend a ton of money on a pair of shoes that I’ll only wear a few times. However, a few months ago I received a gift card for Macy’s and I decided to splurge on a pair of Jessica Simpson Ballet Flats because the reviews were so fantastic and because they’re just so pretty. I was undecided about which color to choose, so I ordered them in black and natural and I figured I would just return the ones that I didn’t want. Y’all. These shoes are so amazing. They don’t slip on your heel, you can dress them up or down, they add elegance to pretty much any look, and the best part – when you wear them – you feel like you are walking on a cloud. They are cushiony, soft, and wonderful and they also come in snake print, coffee (brown), and gold (which I now neeeed.) I cannot say enough good things about these shoes! So I kept both pairs. And I fully intend to wear both until they fall apart. You can get yourself some here. You won’t regret it. And this isn’t even a sponsored post. I just love them that much. I love them so much that I posted a picture on Instagram several months ago, and Macy's recently contacted me and asked me if they could use the picture on their website. And as a matter of fact, when I popped over there to grab the link for this post, there was my picture from Instagram, front and center right on the product page! So exciting! So of course I had to grab a screenshot for you! Oh my goodness, I need those ballet flats! Adoreeee! Ok how in the world have you guys gone so long without a child related incident to your home!? We must be a rowdy bunch because stuff is always being spilled on, ripped and sometimes broken! And those flats, LOVE. I might have to add to my Christmas list!! Oh and way to go Jacob!! That is seriously amazing!! I don't know how we've managed to keep everything so intact. I knew it was just a matter of time before something went wrong!! hahahah, dying over the Luke Bryan comment. Don't we all wish?! And so awesome your little guy is reading so well! Good for him!!!! I'm impressed that you made it that long without an incident, and the tear totally works. Love those flats, I'm off to check them out. 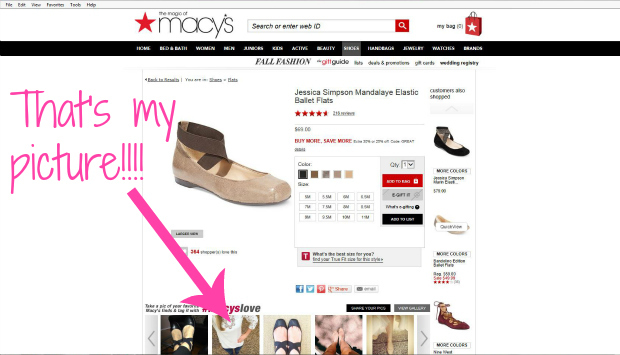 So fun that you were featured on Macy's - one of my favorites!! I've seen those ballet flats! Love them! Have a nice week! Thanks, you have a nice week as well! Oh my gosh - how exciting that Jacob is reading! You've got a smart little guy! Too funny about the phone and I'm sorry about your first destroyed book...or book page. That stinks. Eliza is my little book destroyer. I love that girl, buy why does she feel the need to rip pages?! Henry never did it, then along came Eliza, my little "book dinosaur." Chomp. Chomp! Hahahaha, yes it's the EXACT same with our two. Jacob was always so delicate with books... even when he was 12 months old! But Olivia? Lawd, that girl is a hot mess. She's ripped more pages in their books than I can count! And she looooves to rip the flaps off of the lift the flap books. It kills me every time!